Bluet & Clover: What's in a Color? In an effort to keep my downstairs looking somewhat pulled together, I've been trying to stick to a color scheme of a grey backdrop (the walls) with bursts (I'm trying to come up with an alternative to saying "pops" or "splashes of color" because even though I hear designers say it all the time on TV, I feel silly saying something like, "That chair would add a nice pop of color to the dining room.") of dark orange, pale blue and a teal or maybe turquoise. I thought, wouldn't it be a good idea to paint a couple of side tables in the living room the same orangey color as the dining room drapes? I read in Fresh Home magazine that your paint store can color match almost anything. I wasn't so sure when I took a closer look at my fabric swatch. There are so many threads in varying colors that make up what, from a distance, just looks like solid orange. Maybe they have some super cool scanner that takes in all the variations and comes up with a composite color, I thought. As it turns out, there is no magic scanner and they can't match a paint color to a fabric swatch. That was at my local Sherwin Williams store. The guy there said that some other stores claim to be able to do it, but I figured it would just be easier to hand pick a paint color myself than head off to Home Depot. 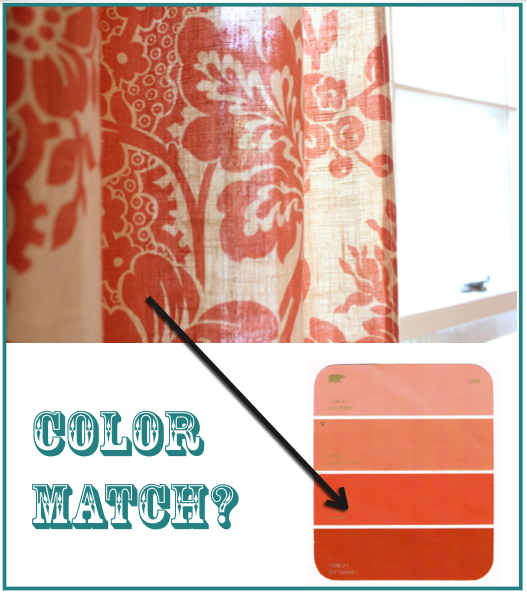 What turned out to be the closest match was something called "Robust Orange," but the name really turned me off. It sounds too strong for a living room accent color. So I went for something a little paler and closer to the corals called "Emotional." Honestly, that name doesn't do it for me either, but it's better than "Robust Orange." Shakespeare may have been right when he said a rose by any other name would smell as sweet, but, if you ask me, an orange by the name of Robust doesn't look as good as an orange named Emotional and not nearly as good as one named Persian Melon (that's Benjamin Moore's). Ha! Ha! That's a funny post. I'm trying to think of alternatives to "pop" and all I can think of is a "fart" of color, which doesn't sound so good. Especially if it would be a "fart of Robust Orange." That's pretty gross. How about a hurl of robust orange? How about "l'explosion de la couleur"? If it's French how bad can it be? Also ran across "éclater en sanglots" as I searched "burst" in my French dictionary. It means to burst into tears and may follow l'explosion de la couleur. I like "l'explosion de la couleur." That's hilarious. But maybe since my blog is called Design Dreams Japan, I should use Japanese. I'll have to double check, but I think that would be "iro no shibuki." Splash of color.